SEGA was thrilled to host happier founder, Nataly Kogan, and her family as part of a group of 11 mothers and daughters who recently traveled to the school. Special thanks to Nataly for sharing her insights, experience and love with our staff and students. Enjoy Nataly’s blog below in her own words. Two weeks ago I traveled with my family to Tanzania, to spend a few days at the SEGA Girls’ School and share some happier and art lessons with the girls who study there. But I never expected that these girls would become my teachers, bursting my heart open and reminding me about the true meaning of gratitude and joy. The girls who study at the SEGA school come from extreme poverty. Many of them don’t have two living parents, having lost one or both to malaria, AIDS or other diseases. 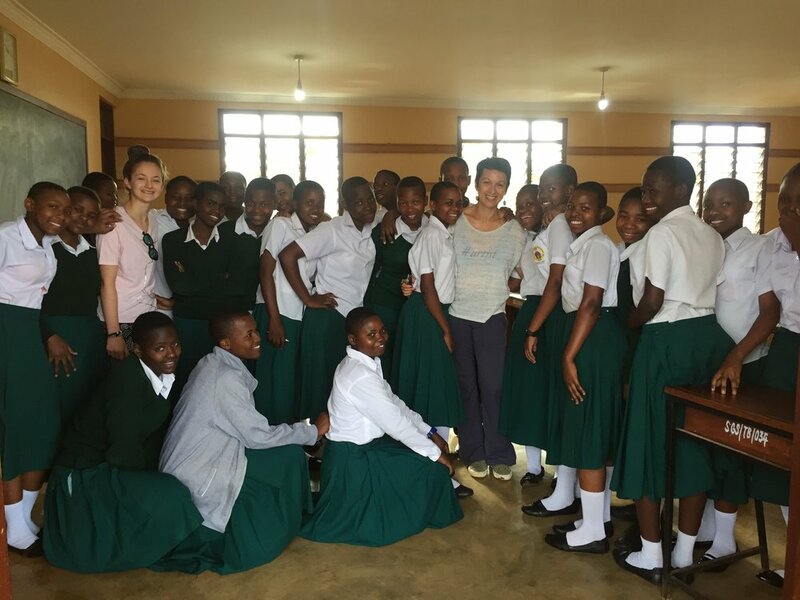 While the school provides them with room and board, in addition to an excellent education, these girls don’t have any extras — no toys, phones, jewelry or fun clothes beyond a school uniform, or books other than those in the school library. And yet, they are so deeply grateful for everything they do have. I’m grateful that we have peanut butter at the school. I’m grateful to have good teachers who care about me. I’m grateful because I have all my basic needs met at the school! I’m grateful that we have computers. I’m grateful because I am alive. These girls who don’t have very much are so deeply grateful for so much. They are so grateful for the very basic things many of us take for granted. Having people who care about me and people to love. A comfortable home and never worrying about whether my family will have enough food. Fresh water running from our faucets. Lights when it’s dark. Heat when it’s cold and air-conditioning when it’s hot. Cars that can bring us where we need to go. Books to read, movies to watch, music to listen to whenever the desire strikes. The blessing and the curse of the human brain is that it adapts — to the good and the bad. And once we adapt, once we get used to something, we come to expect it to be there. Rather than being in awe of being alive, of having food and water and shelter, we take these as our rights, as given, as our baseline and strive for more from there. This is human and it’s not our fault. It’s completely normal. But spending a few days with these amazing humans in Africa reminded me that if we can not take our basics for granted, if we can feel genuine and deep gratitude for them, life becomes a series of miracles. We can feel joy in the most mundane moments. The everyday becomes the extraordinary. No, our problems don’t disappear. Neither does all pain or sadness or stress. Those are all real. But actively feeling grateful for the very basic aspects of our lives gives us so much emotional fuel that we can get through our challenges and stresses with more resilience. And we can experience so much joy. We don’t need a lot to be grateful. We simply have to remind ourselves to be grateful for what we do have. Since returning from our trip, I’ve begun to pause a few times a day and say to myself: Imagine life without this. “This” is anything ordinary, from walking into a store full of food to opening up my computer to do work. “This” is anything that I’ve come to expect to always be there. I feel like every time I do this, my heart smiles and life feels fuller and richer. I’m so grateful to the SEGA girls for sharing this gift of deeper gratitude with me. And to you, for letting me share a bit of this experience with you — because I don’t take for granted, not for a moment, that you’re willing to share a bit of your attention and time with my by reading what I write.